Australian artist Kathryn Ryan brings ghostly luminous trees and evocative light and shadows to life. She has been painting the South Victorian landscapes of Australia for years. Inspired by the quality of light, mood and atmosphere in her landscapes, she uses meticulous layers of paint and glazes over many months to achieve remarkable depth and luminosity, harmony and balance in her paintings. 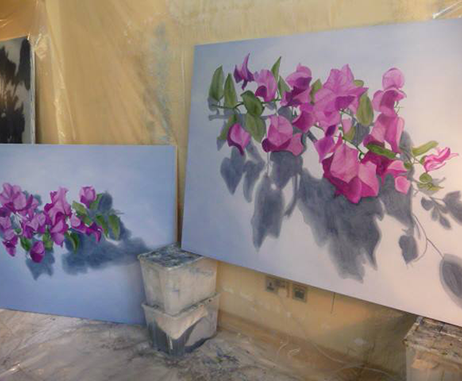 Now that she is living in Dubai, she has begun a new series of work responding to her environment that is inspired by the light and shadows, and accentuates the organic and sensual nature of plant life and Arabic lanterns in her local surroundings. Her charcoals are built up in layers of mark making and rubbing away to leave the essence of the evocative nature of light and shadow within her pieces. Her works have been extensively exhibited in major commercial galleries and she has been a finalist in many prestigious National Art Prizes. Her works are held in many major Australian collections including Parliament House Canberra, Macquarie Group Collection, RACV collection, Artbank & BP Australia. She is further represented by Olsen Irwin Gallery in Sydney and Flingers Lane Gallery in Melbourne where she holds major solo exhibitions each year. Kathryn Ryan holds an Honors Degree of Fine Art from the Royal Melbourne Institute of Technology and a Bachelor of Fine Art, Painting, from Warrnambool Institute of Advanced Education. This Autumn Capsule Arts will launch a set of limited edition art prints by Kathryn Ryan from her Dubai collection, that will be available to purchase at capsulearts.com. For more details about her featured artworks and the launch collection sign up here.